For those of you who have missed the news recently, Basildon BC are facing a bit of a tough time from just about every angle as they start the process of physically evicting around 400 travellers from their current site this week. Originally they had planned to send the bailiffs in first thing on Monday morning, although a late court injunction was granted to put this back until at least Friday, and then possibly longer after that. It has also taken years to get to this stage. The Council will not have been sitting idly by during this time waiting for it all to come to a head before moving in, which makes this last minute reprieve for the travellers a little puzzling. They will have surely been trying to abide by the law and contacting the community to tell them their concerns and the issues which were arising, and looking for an easier, quicker, cheaper solution. To think that years of acriomony and mistrust will be swept aside within a week and an amicable solution reached seems a little too far in the realms of fantasy for me. Of course, on the other hand they are now being accused by some of being bullies with scant regard for a community’s culture, traditions and way of life. They are being accused of not communicating adequately with the travellers on the site, and being over the top with regards to enforcing the court’s original orders to begin clearing it. They are edging towards being put into the ‘them’ in the ‘them and us’ comparison many neutral observers may take. On one hand therefore they infuriate local people, on the other they break up a community and simply shunt the perceived problem somewhere else – these travellers are not simply going to disappear of course. And through this whole process they are spending tens of thousands of pounds up to millions on dealing with the situation, depending upon which report you choose to read. This is a high profile example of the challenges faced every day by local authorities up and down the country. They simply cannot please all of the people all of the time; there is no such thing as a win-win situation, just a minimise-the-negative-impact-as-far-as-possible situation which is played out time and again at every scale. Planning is a simple example; allowing a building might satisfy the developer but not their neighbours, whilst denying it will see their scheme (and existing investments) crumble whilst delighting others. Local budget setting processes are another ever more prominent version of this battle; cut one service and another may survive, but who is to say which is more valid, important or needed? Once initial fat is trimmed it is only going to become more difficult to make these decisions, and local authorities are looking leaner by the day. And you can be sure that there will be no last minute high court injunction to put off the need for councils to find additional savings. The situation on Dale Farm is one in which too many people will lose, whatever the outcome. Both sides have painted themselves into a corner, with neither willing to give in nor feeling like they should have to. Indeed, if you hear either party being interviewed they typically claim to have gone out of their way to be helpful, and are willing to abide by the decisions of the courts (assuming the courts agree with them of course). Overall it is a sad metaphor for situations big and small which challenge officers day in day out, and one which all councils should be looking at and seeing if they can learn from in some way. If one learns more from defeat then from victory, this should indeed be a huge lesson to the travellers, the Council and the country. This entry was posted on September 20, 2011 at 6:00 am and is filed under We love the Council. You can subscribe via RSS 2.0 feed to this post's comments. This is the most sensible and balanced thing that I have read on the Dale Farm situation in a long time. As Deputy Leader of Basildon Council I had hoped that it would never come to this, but in the end we have to enforce Planning Law for everyone, not just when it is easy. Local people would not understand or accept enforcement actions against them if we had left such a large illegal site unchallenged. Fairness and equality before the law has to override other considerations in this matter. As you speculate, we have tried to find another way, but the Travellers and their advisers approach has been to go to the courts first as opposed to any kind of mediation. Even in the run-up to the clearance and actually in the face of it we have litigation, not dialogue. So, sadly, we are left with an adverserial relationship and no choice but direct action. Their were two court cases on Monday. In the Appeal Court, the Travellers lost an action that would have made it illegal to evict sick people under Planning Law. This would have struck at the principle of the Dale Farm Action, and would have had very serious secondary implications throughout England. The second case was a technical matter that led to the injunction. It will either be resolved on Friday, or shortly after as it is essentially about the paperwork. It also puts conditions on the Travellers to dismantle barricades, allow access and to control the protesters. We’re not trying to take sides with this post as we know too little first-hand, just trying to point out the challenges presented in this situation and how it is anything but a simple, recently created problem which can be easily solved to all party’s benefit. I am glad to see a blog about this situation that stays calm and relatively balanced. What the blog doesn’t acknowledge is the extreme difficulty for travellers of obtaining planning permission to develop pitches on sites that they own, *and* the extreme level (and type) of challenge local authorities face when trying to expand or establish new council-owned sites. I wouldn’t suggest that the application of powers of forced eviction in relation to planning law breaches is inherently racist in this situation – clearly the law is neutral. But I have seen enough local responses to proposals to create or extend sites to know that the objections on which the application refusals are based often spring from racist attitudes, which mainly boil down to ‘they’re not like us, we don’t want to live near them’. Certainly much of the commentary on the situation at Dale Farm explicitly suggests that violence towards the Travellers would be a good thing; includes untruths or extreme generalisations about Traveller behaviour and in some cases calls for Traveller culture to be obliterated. 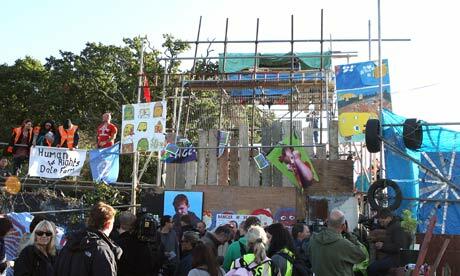 There is scope for the council to take powerful moral leadership here to denounce those attitudes, even while it pursues it’s objective of returning the site to only those pitches which have planning permission; that might help to create a climate of trust in which a mediated solution would become possible. I am saddened by the principle at the heart of this blog, which seems to be that if a big enough gang of your neighbours objects to your presence, you can be hounded out of your homes; and that it’s the council’s job to listen to the voices that shout loudest, effectively deploying planning legislation as a posse. I absolutely understand the right the council has to take action in accordance with the legislation, but just because it can, doesn’t mean that it must. I would like to see leadership of another kind. While I do agree that amicable solutions should be sought, is there perhaps a stage when it appears clear that nothing will come of extended discussions and that a decision needs to be made one way or another?